Clawgrip (Clawglip in the cast roll of most versions) is a giant Sidestepper and a boss from Super Mario Bros. 2. Fought in World 5-3, Clawgrip would attack players by using his claws to throws boulders at them. In order to injure Clawgrip, these boulders would need to be caught by the player's character and thrown back at Clawgrip. After being hit five times, Clawgrip would be defeated. In Super Mario Advance, Clawgrip, instead of being a giant crab at the beginning of the battle against him, is simply a small Sidestepper. Clawgrip is grown to his giant size when he is engulfed by several bubbles which resemble the ones Wart is capable of spitting. Once at this size, Clawgrip, in a stereotypical pirate accent, will exclaim "Yar! You'll make a tasty treat!" and begin to throw boulders. It is possible to hit him twice if a player throws a boulder so that it bounces off the wall behind him when he starts moving towards them. After defeating him, he will say: "Yar! You got me! ", again in a pirate accent. He was voiced by Charles Martinet, who voiced all the bosses except Birdo and Robirdo. Clawgrip returns with the other bosses from Super Mario Bros. 2 in BS Super Mario USA. Like in the first game, Clawgrip serves as a mini-boss, and is fought in a similar way as in his battle from Super Mario Bros. 2. Clawgrip, from The Super Mario Bros. Super Show! episode, "Mario of the Deep". 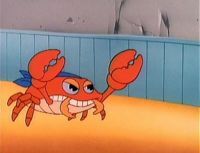 Clawgrip made three appearances in The Super Mario Bros. Super Show!, where he, along with Mouser, Fryguy, and Tryclyde, was a minion of King Koopa instead of Wart. In all of his appearances on the show, Clawgrip wore a blue bandanna on his head. Clawgrip's debut in The Super Mario Bros. Super Show! was in the episode "Rolling Down the River", where he manned the help of Captain Koopa's ship, the Sinister Star, while Koopa was making Mario walk the plank. The Mouth of the River used a cannon to fire a Turnip at Clawgrip, knocking him down onto the ship's lower deck. In "Pirates of Koopa", Clawgrip can be seen among the minions of Blackbeard Koopa waiting for his return to Pirate's Port. Clawgrip's last appearance on the show was in "Mario of the Deep"; here, a Clawgrip attacks Mario, Luigi, Princess Toadstool, Toad and their Mermushroom companion in a sunken ship. The quintet avoid the Clawgrip by jumping over him and going through a hatch that was too small for Clawgrip to pass through. The characters commented that this Clawgrip was simply a Clawgrip, implying that Clawgrips are a species. In Nintendo Comics System, Clawgrip, instead of being a single character, was portrayed as a species, all of whom seemed to work for King Bowser Koopa. In The Fish That Should've Gotten Away, several Clawgrips appear among the monsters trying to defeat Mario. Mario manages to avoid these Clawgrips, all the while being annoyed by Stanley the Talking Fish. Clawgrip and some of his GLOM-created clones try to attack Mario while he is exploring the Mushroom Kingdom in Double Trouble, but he manages to avoid them. In Pipe Down!, Clawgrip appears guarding a tunnel which leads to Pipe World under the Mushroom Palace. If Mario and Luigi give Clawgrip a noisemaker or a pair of boots, he will let them pass peacefully, but if they give him a balloon (which he accidentally pops) or try to run past, he will grow angry and give chase to them. The brothers can distract Clawgrip by throwing some coins at him, but if they do not have any or decide not to give any up, Clawgrip will catch up to the two, leading to a Game Over. 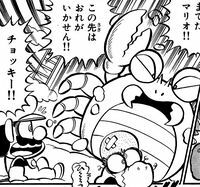 Clawgrip makes an appearance in volume 8 of Super Mario-Kun. He is first seen shortly after Fryguy is defeated. Mario, Luigi, and Yoshi eventually fight him. As with the games, he fights by throwing rocks at them. In one twist, however, Mario molds a boomerang from a small heart and then throws it at him. Clawgrip then transforms into a large polygonal being. Mario uses a rocket to defeat him. Chokkī Referring to chokichoki, a cutting sound mainly by scissors. Chelo From chela (pincer) and the endearing male suffix -otto. In Yume Kōjō: Doki Doki Panic, Clawgrip did not exist and his place as a boss was filled in by a third, cream-white Mouser. This makes Clawgrip the only Super Mario Bros. 2 enemy that actually was introduced in said game. Robirdo was similarly introduced in Super Mario Advance as another major enemy that did not exist in a prior version. According to his original description, he apparently "grows suddenly". This is detail is only present when approached in Super Mario Advance. In the credits of Super Mario Bros. 2, as well as Super Mario All-Stars and the Japanese version of Super Mario Advance, Clawgrip is called "Clawglip." This is likely because the "r" sound is not normally distinguished from the "l" sound in Japanese compared to other languages. ↑ "He grows suddenly, and he is surprisingly skilled at throwing rocks." - Super Mario Bros. 2 instruction booklet, page 28 (Clawgrip description). This page was last edited on March 20, 2019, at 19:19.